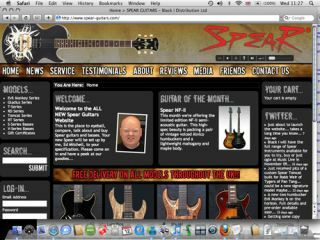 PRESS RELEASE: Black i Distribution, the official distributor of Spear Guitars in the UK, has announced the launch of a new UK-based Spear website, www.spear-guitars.com. The company has made the decision to sell direct to the public to offer a level of service not generally seen in the UK. When a customer buys a guitar or bass from Black i they can specify the gauge - and brand - of strings supplied and the playing action. Black i can also supply the guitar set up for a particular tuning: standard, alternate, drop D... you name it. The instrument will have its frets dressed, have its intonation adjusted and be fully tested before it's posted to the customer in a free gigbag. Spear instruments range in price from £229 to £499. They come with a range of pickups depending on which guitar you buy including Spear Monster 'buckers, EMG-HZ pickups and the Seymour Duncan 'Jeff Beck' model. Guitar models include the highly regarded Gladius SP NOP neck-thru body rock guitar, the distressed (in a good way!) RD-Relic with P90 pickups and the Evil Monkey Series. Full specifications of each guitar and bass can be found on the new website. Black i Distribution will officially launch the new Spear website at the Music Live Show in November 2009 but the site is live and ready to eyeball now. For more information, visit www.spear-guitars.com.